Many people believe that if they were to make more money, have a nicer car or larger house, be in a relationship, have more friends, be more attractive or lose weight, have a different job, live somewhere else, and on and on, then they would finally be happy. But this is a false belief and even if obtained, will never truly bring happiness. Yes, it might result in temporary joy or happiness, but it will not be sustained and remain long term. Other people, material goods, money, or physical appearance, in and of themselves, can never bring true happiness, it is only what we think about someone, something, or our situation in life that have an impact on our happiness. Let’s look at an example of an external factor in one’s life, say your job. If you think mostly negative thoughts about your job, such as “nobody appreciates me here,” “nothing I do matters,” “I hate this job,” then you will believe those thoughts and be unhappy about your work situation. You may focus only on the negative aspects of your job or your performance, have a significant amount of negative thoughts about your situation, spend a lot of time searching for a new job, and let your unhappiness at work negatively impact other areas of your life or overall mood. The primary thought may then become “I need to get out of here, a new job will make me happy.” On the other hand, if you are able to accept your situation and have more positive, or even neutral, thoughts about your career, such as “I am good at what I do,” “this is a good fit for me,” or “I appreciate the work I have,” you will be able to feel content and happy. There will then no longer be a need or desire to leave the job in an attempt to find something to make you happy since you already will be. The same holds true for the thoughts about ourselves and how happy each of us are about ourselves. If you are constantly thinking thoughts such as “I need to be a better mom/dad/wife/husband/girlfriend/boyfriend,” “I’m so ugly,” “I always mess up,” “I can’t do anything right,” or “nobody will ever want to date me,” how could you possibly be happy? If those are the thoughts that are running through your head all day, how could you expect to ever feel good about yourself or your life? There is no way that would be possible with all that negativity. As with external factors in our lives, we need to change the way we think about ourselves and what we say to ourselves to be able to impact and improve our happiness. Even just comments to yourself such as “I am doing the best I can,” “I will get there,” or “I appreciate what I have right now,” can have a huge positive impact on your happiness. You could have all the money in the world, the most amazing career, a perfect body, and the best significant other, family, and friends, but that would still not matter if the way you think about things is not positive. If you still continue to think in a negative manner or not appreciate what you already have in your life, you will never be happy no matter how much you have or what happens to you. Changing the way or what we think is really the only way to be happy. We are each in control over our own happiness, not anything or anyone else, and it all starts and ends with what we are thinking. 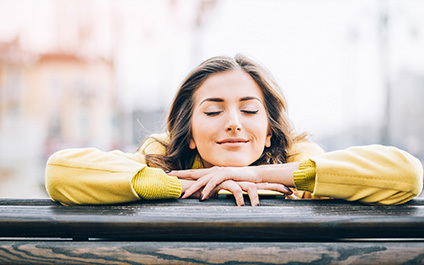 Therapy, specifically Cognitive Behavioral Therapy, can be a great way to work on and improve thought processes and the impact they have on us and our lives. Please contact Symmetry Counseling today to schedule an appointment with a therapist who can help you improve your thought processes.